Do you feel stressed or embarrassed because your puppy cannot sit? This is such a common command that when our dogs or pups don’t know it, we can feel ashamed or feel as if something is wrong. We get it. You are not alone. In fact, I just trained two older dogs this past week to sit. They didn’t know the command and one of them even had trouble even offering a sit. She just wanted to stand. So let’s create your dog to sit now. We will help you with your Salt Lake City puppy training. One method is to use a lure. Put a treat in your hand. Touch your hand to your puppy’s muzzle. As your puppy follows the treat, he will move a bit back and then feel the urge to put his bum to the floor. Once his bum touches the floor c/t (click and treat). Repeat this until your puppy readily follows your hand motion and sits. Once this happens, say the command “sit” right before you lure your puppy. 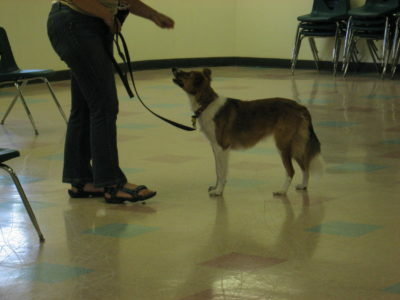 Now you are on the right foot for Salt Lake City puppy training. You can also use another method called behavior catching. You wait until your puppy sits randomly on his own. When he does c/t (click and treat). Because you are rewarding the sit, your puppy will begin to sit more often. When you are able to predict that your puppy is going to sit, say the command right before he does. If you still need help with Salt Lake City puppy training there are many reward-based trainers that you can check out. We also have our own group puppy classes, and we definitely cover sit.